Korea’s leading blockchain company builder Chain Partners will join hands with the Yozma Fund to pave the way for Korean and Israeli companies to collaborate on the occasion of former Israeli Prime Minister Ehud Olmert’s visit to Korea to attend the Asia Blockchain & Fintech (ABF) in Seoul. Olmert , 73, is famous for sparking a startup boom in Israel with his active support for venture businesses and foreign investment. Olmert will visit Korea Oct. 28 to make an opening speech for the “Fuze 2018,” the main event of the ABF in Seoul co-hosted by the Seoul Metropolitan Government, the Seoul Economic Daily, Chain Partners, WeWork, CTIA and VIG and supervised by blockchain media Decenter. 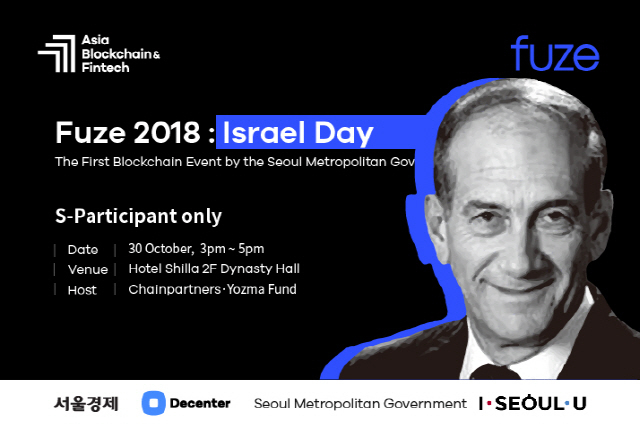 Chain Partners and the Yozma Fund will arrange an “Israel Day” occasion for companies from Korea and Israel to get together to listen to insightful opinions about corporate foundation, business and blockchain from Olmert at the Dynasty Hall of Shilla Hotel at 3 p.m. Oct. 29. While serving as the prime minister, he won fame for having linked Israeli businesspersons to the CEOs of other countries. The Yozma Fund, the co-organizer of the “Israel Day” event, was created by investments raised abroad while Olmert was working as the minister of industry. Yozma signifies ‘creativity’ and ‘initiative’ in Hebrew. The event will draw Israeli businesspersons in Korea, Korean companies interested in entering Israel, Korea’s small and medium-sized businesses and engineers from around the world who won hackathons. Also taking part in the event is Yoon Jong-lok, former president of the National IT Industry Promotion Agency, who translated “Start-up Nation,” a book on Israel’s miraculous economic growth, into Korean. Olmert and Yoon have a special relationship as the former wrote an endorsement for the translated book. Partners for the “Fuze 2018” and those having special participant (S-Participant) tickets are also able to take part in the “Israel Day” event. “Israel Day” is a gathering where Israeli companies, emerging as a blockchain powerhouse, and Korean companies, knocking on the door of the global market, come together. This event will surely serve as an occasion for Korean businesspersons to meet Israeli startups, take practical counsel on the country’s industry status and entry strategies from experts and seek collaboration with them.